With Memorial Day just passing and patriotism still hanging high in the air, we wanted to bring you some of our favorite brands that are based right here in the United States. Tennis is one of the most international sports, but there are still over ten million people play tennis nationwide, and the US Open Grand Finals is one of the most popular sporting events to watch. While there are few Americans outside of Serena and Venus Williams that tend to make big splashes at tournaments, there are quite a high number of brands right here that help elevate the game. The first one is Wilson, one of the most popular and iconic brands on tour. Wilson makes shoes, clothes, accessories, and more but are most known for their very high performing racquets. They have players such as Roger Federer, Madison Keys, Kei Nishikori, Simona Halep and way more playing with their products and for good reason. Ever since Wilson began working in the sporting goods industry in the 1960’s, they have been focused on bringing quality products to everyone. They began in Chicago working in partnership with the Cubs, and now their logo and products are everywhere. They created the Pro Staff racquet line, possibly the most iconic since the days of the T2000. Wilson has been a major name in tennis for all of my life and with endorsements from young players like Grigor Dimitrov, Borna Coric, and Elina Sviltolina, they are not going away any time soon. Second, and slightly less well known is Gamma. Gamma is a bit of an unsung hero in the tennis world. They don’t make very popular racquets, shoes, or clothes so you do not see their logo as often as you see others, but almost any adept tennis player will sing the company’s praises. They make items such as grips, dampeners, junior racquets, stringing machines, and tennis balls. Their products are perfect for new players and this company – Based out of Pittsburgh, Pennsylvania – has done so much to keep the game alive and thriving. They sponsor players and tournaments throughout the United States and are dedicated to not just making the best products but cultivating the best tennis experience. Third on this list is the ever popular shoe brand, New Balance. They are probably known more for their casual shoes than their tennis technology, but they bring the same level of excellence to the court as they do to the couch. Their extremely high functioning clothes are among the most underrated tennis apparel and will begin to get more popular are more and more people think of this brand as more than just a large shoe-maker. With professionals like Milos Raonic who wear the clothes, there is no telling how big they can become. Think of them like an American version of ASICS. TravisMathew is the newest brand on this list, and they are rapidly growing in the United States due to their mixture of high quality materials and a laid-back vibe. Perfect for both on and off the court, these clothes are designed to keep you cool and make sure that you are adequately dressed for each occasion. Founded in 2007, TravisMathew draws its inspiration from all aspects of Southern California culture and lifestyle. Our focus on making premier men’s apparel for work and play has cemented our foothold in the sportswear world. Over the past several years, TravisMathew has been leading the way in quality and active-wear design. This brand remains committed to constant innovation and discovery to bring the best to its customers. The last brand on this list is the very popular tennis brand Tourna. The Georgia based company is famous in the tennis world for their top-of-the-line grips, but they create much more than just that. 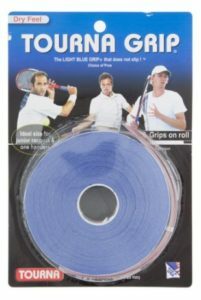 The secret to the success of Tourna-Grip ® is that the grip actually performs better with moisture, meaning that as your hands start to sweat when the match is tight, Tourna-Grip ® is there to make sure a slipping grip is nothing to worry about. A proprietary manufacturing process and individual layer and liner construction means that, though many have tried, no one can beat the quality and precision of the Tourna system. They also make strings, dampeners, and wristbands all designed to accentuate your game. Check out the Tennis Express Memorial Week Sale, where you can get items up to 80% off!